One of my fave home grown restos in our Davao Food Crawl is perhaps The Good Food Co. (TGFC). I enjoyed our time tasting and eating good food with the company of fun foodie friends. 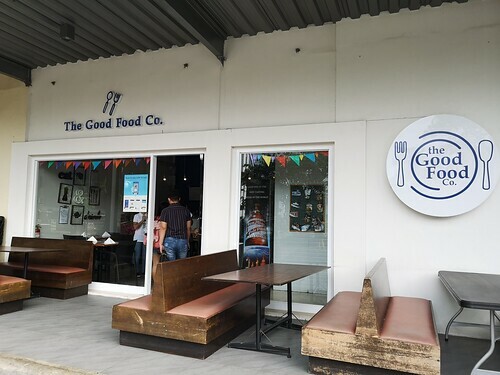 The Good Food Co. is a Filipino-Western Fusion restaurant that aims to bring Good Food and Great Company in Davao City. 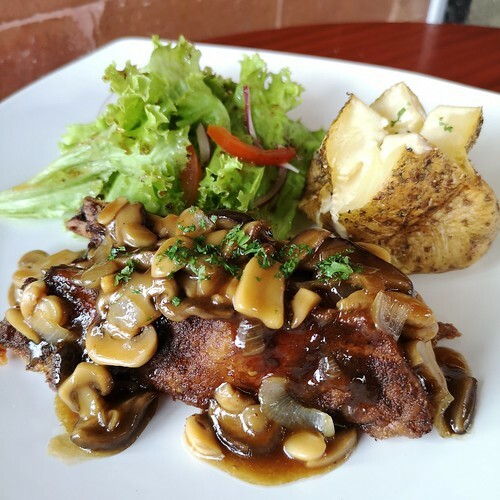 TGFC offers choices of good food using quality ingredients from suppliers that are within Davao City and Mindanao. It is a good thing that our local homegrown restos such as them love and support local producers and their products. Dessert comes first… and since it was around mid afternoon when we were there, I went to taste their Mango and Graham Crepe first. 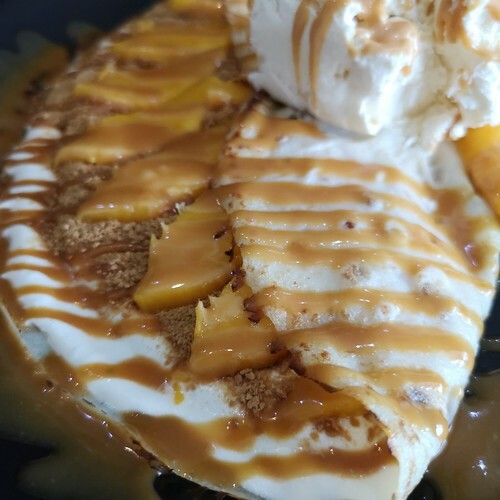 For the love of dessert with mango! 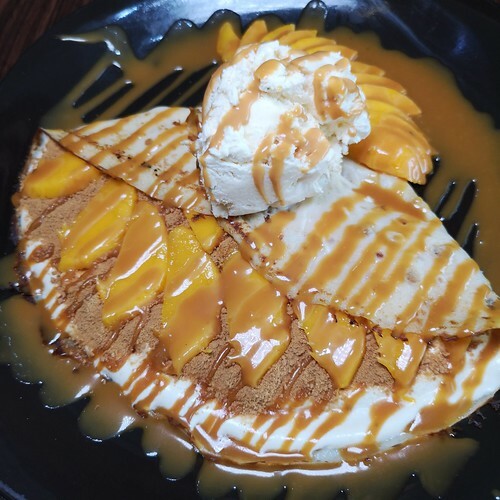 It has been awhile since I had freshly made crepe with slices of delicious mango. It was good dessert and perfect for summer time. 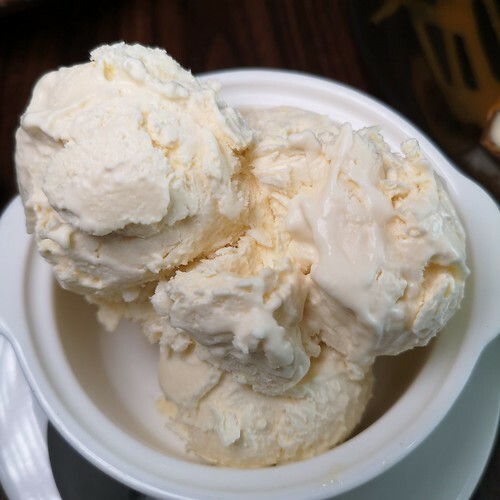 This one is good for sharing unless you want to indulge in this dessert all on your own. 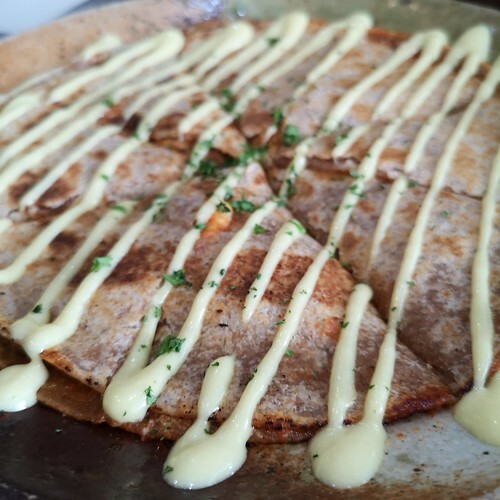 The crepe dessert is served with their own home made ice cream. 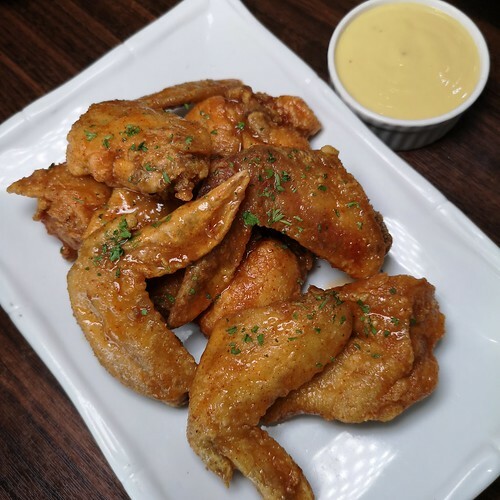 Buffalo Chicken Wings covered in buffalo hot sauce to spice up your dining adventures with your foodie friends. Chicken Quesadilla best to share with friends and family while chatting and catching up on each of your day’s stories. I actually enjoyed these one. I ate these chips below alternately with their quesadilla. They have a good dip for it too called aioli or garlic mayo which I assume is made of mashed garlic with mayonnaise and olive oil. 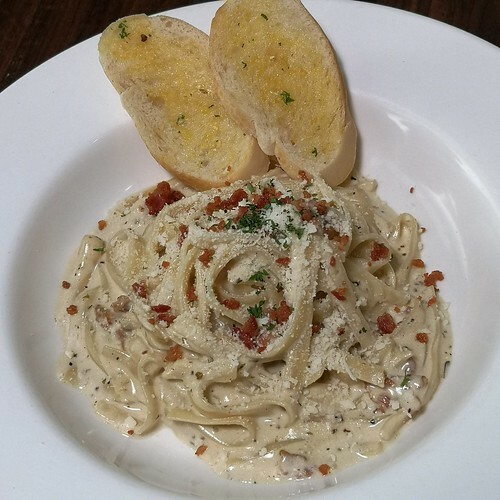 TGFC Carobonara using linguine pasta in a cream sauce topped with bacon bits and parmesan cheese. This is a classic fave pasta especially by the younger ones. Pomodoro with slow simmered tomato sauce topped with basil. 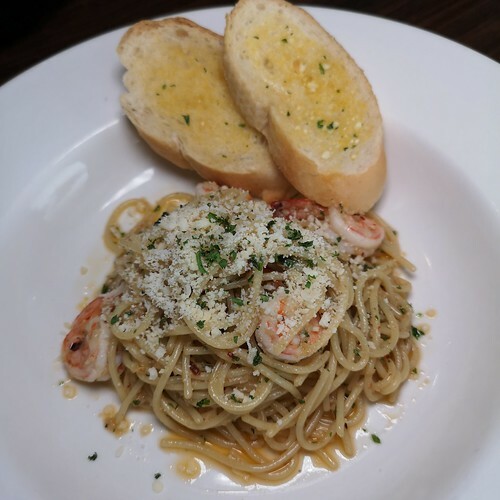 Aglio y Olio is their classic Italian spaghetti with garlic, shrimp and olive oil. 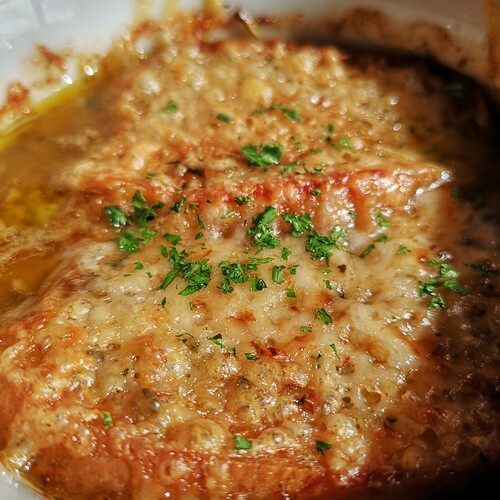 Topped with parmesan cheese. Simple yet delicious! 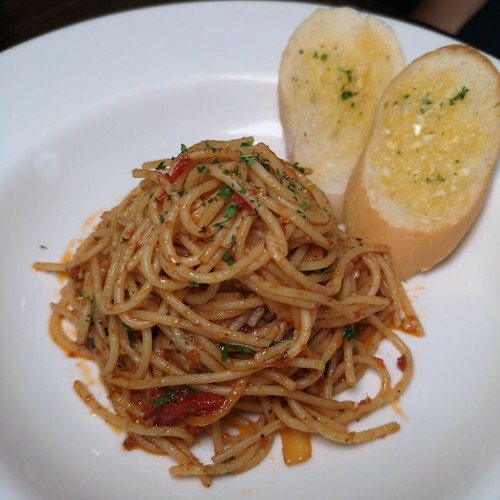 I enjoyed these pasta dishes but perhaps the quintessential pasta dish of their aglio y olio was my fave during this particular visit. 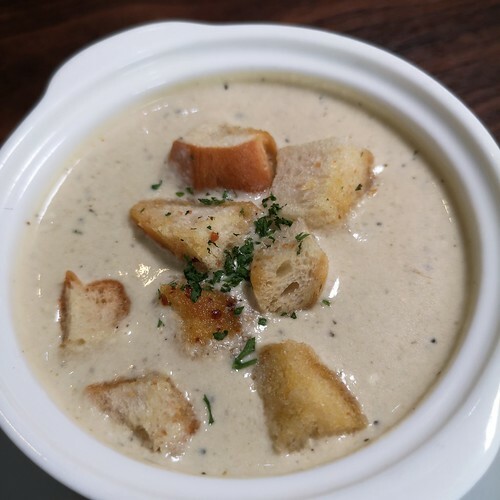 Their classic creamy Mushroom Soup with their own twist was the one I kept on getting perhaps most on our visit too. I had a craving for one which I satisfied by making at home recently. But I guess this soup got me going as I listened to my companions chatting the afternoon away while we were waiting to go to the next resto. 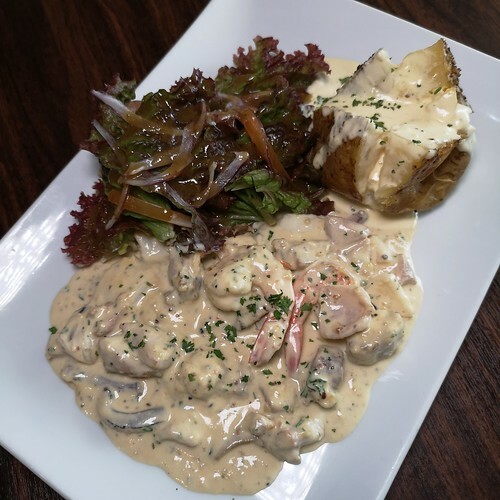 Seafood Garlic Fricassee is a classic French dish with creamy white sauce. TGFC used a mix of seafood instead of the usual chicken. It is creamy. This dish got me with its creamy sauce. 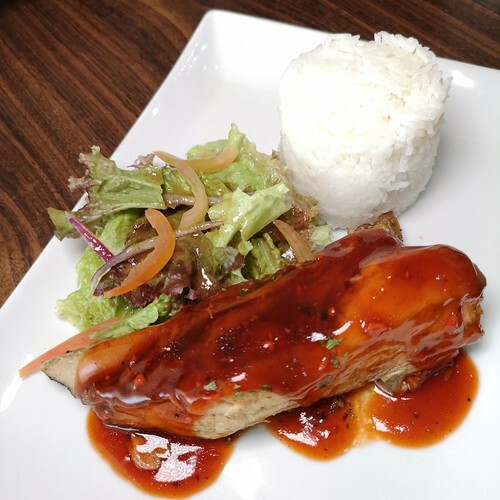 For your main course, enjoy their Braised Pork BBQ Ribs. This has been braised for 6 hours and covered in TGFC original barbecue sauce. Served with rice and house salad as a side dish. 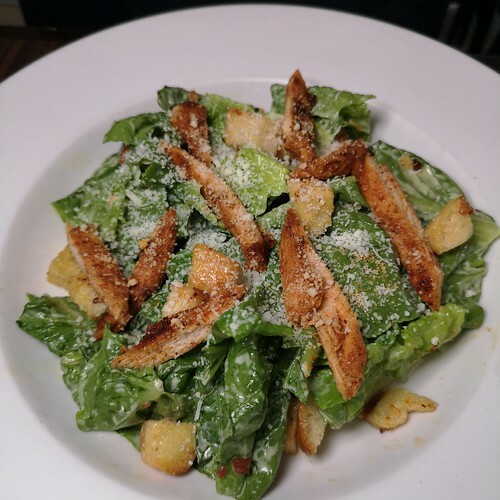 Speaking of salad, when you crave for something healthy and with less guilt, have the TGFC Caesar Salad with grilled chicken breast in cajun seasoning. It’s indeed nice to be back in TGFC as this was something I looked forward to in our food crawl! 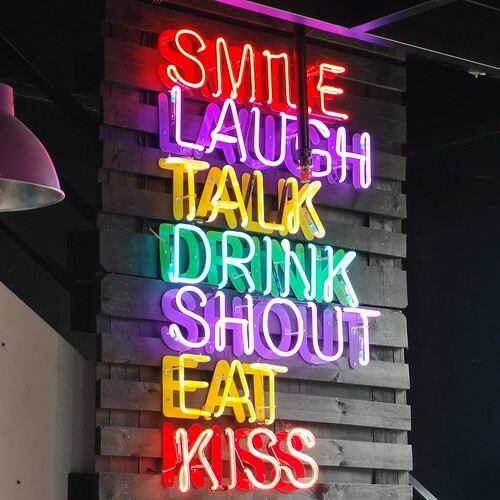 Good food and fun company… what can you ask for? Consistent good food of course for every loyal TGFC customer! 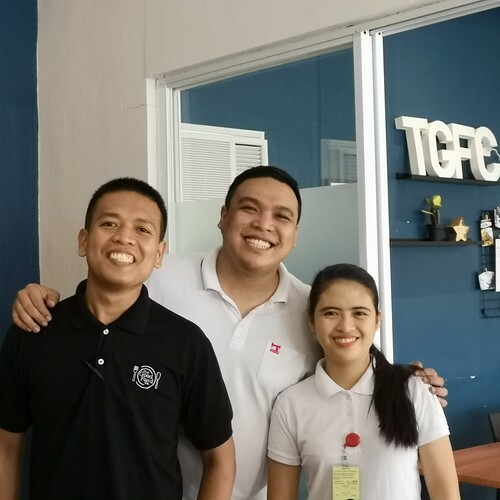 The warm welcome of the very friendly Chef Rolando “Choy” Cebro Lildo III (middle) at TGFC was really appreciated. He also warmly welcomed us in Blah Blah Blah during a previous visit which made a very good impression. Because as a customer, you would love dining in a resto especially a proudly home grown Davao resto where the chef enjoys cooking the food and serving that food to diners and loyal customers. The staff are also friendly which I hope remains consistent through and through. 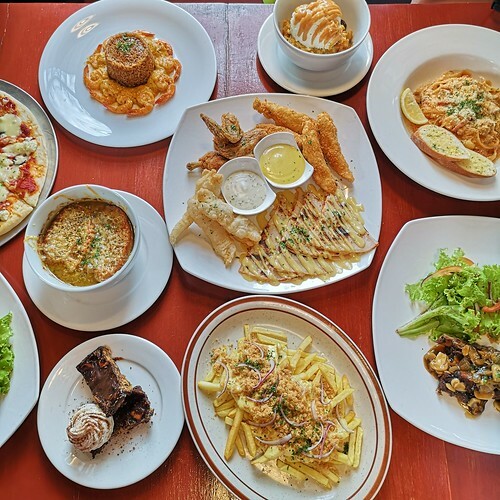 TGFC has mostly the same menu as their Blah Blah Blah resto in JJ’s Commune in Loyola Street of Obrero, except that Blah3x has steak and other dishes not with TGFC menu. So if you are from the south, there is reason to visit and dine their new resto in Obrero too. Check out the catering packages by the way of TGFC. The Good Food Co is located at Row of Restaurants 3 in Matina Town Square (MTS), in Matina, Davao City. It’s on the right side row upon entering the inner part of MTS. 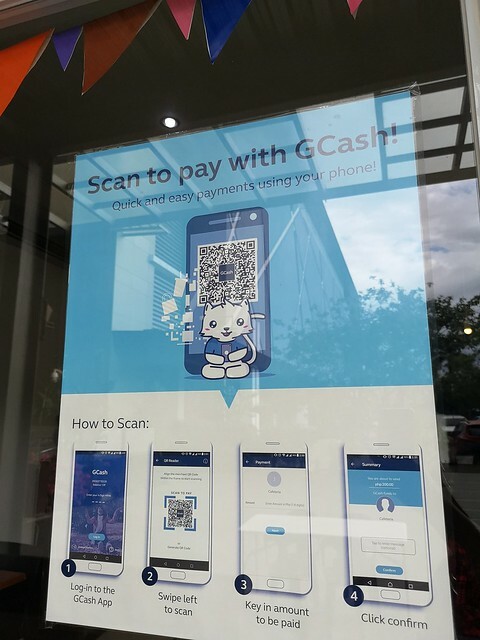 As a GCash user, I was happy to see this at the resto entrance. 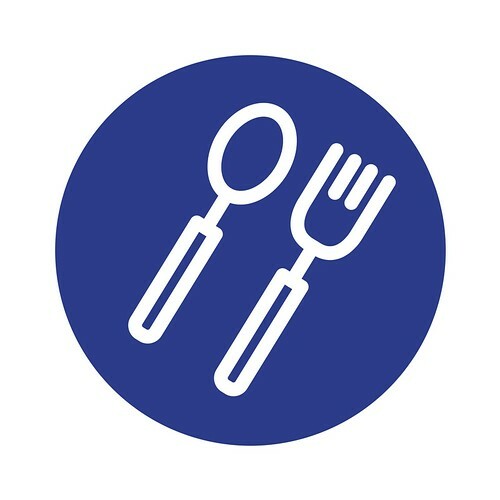 For those into convenient and cashless payments when dining out. 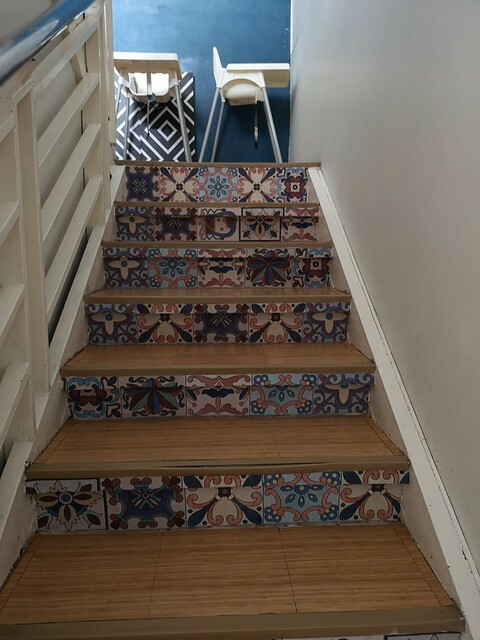 Their cute and nicely decorated stairs makes me think always of feeling at home in a cozy home-grown resto. Follow Facebook and Instagram accounts of @thegoodfoodco and @blah3xPH to get updates especially when they have promos like the buy 1 take 1 on all their main course dishes recently plus their graduation and summer promos. On my second weekend with the Davao Food Crawl, I was able to join the team at the Blah Blah Blah by the Good Food Co located at the JJ Commune Compound along Loyola Street in Bo. Obrero here in Davao City. 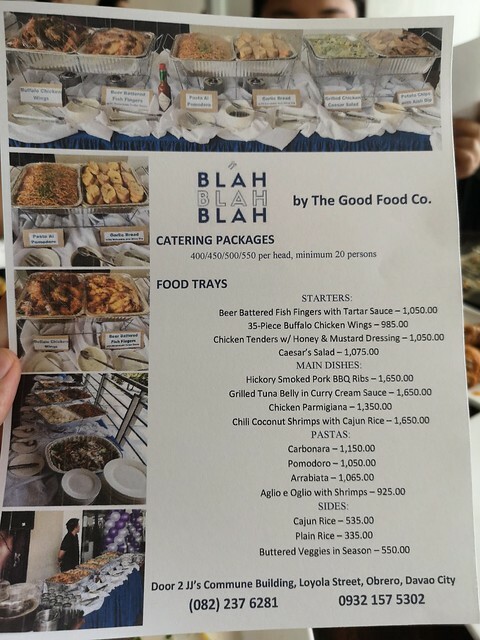 Blah Blah Blah by The Good Food Co. is one homegrown resto that we often pass by but have not really dined in yet with my boys. Since a few months ago, I would see this resto’s name through the foodpanda app when I would search for new restos to order from and I saw that The Good Food Co has taken over. Only last Saturday, March 16 was I able to try them for the first time and here’s what we had at @Blah3xPH! 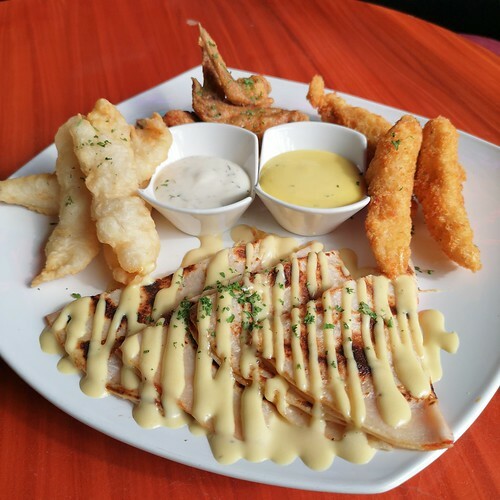 Appetizer Greatest Hits – a chorus of TGFC’s fave appetizers: chicken tenders, chicken quesadilla, buffalo wings and fish fingers in mayo garlic and aioli sauce for dips. Said to be good for sharing for 4 people. 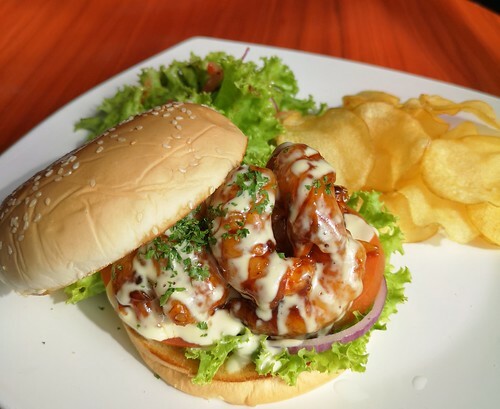 Shrimps in Gochujang Sandwich is one unique sandwich that you wanna try if you are a seafood person. 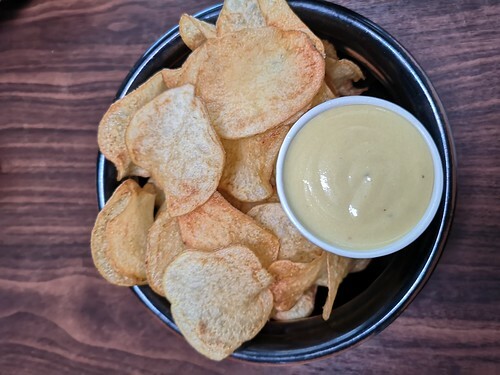 Served with house made crispy potato chips and house salad. 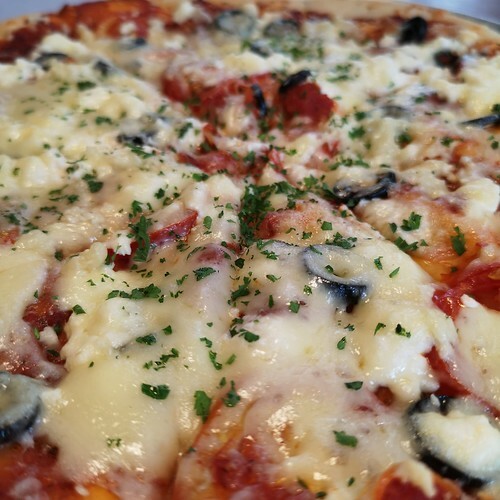 Greek Pizza is a combination of tomatoes, black olives, feta cheese (a staple in Greek cuisine), and olive oil. Enjoy it while it’s still warm. Ribs in Malt Vinegar & Tamarind with Sauteed Mushrooms is a hearty dish to enjoy when at Blah3x! 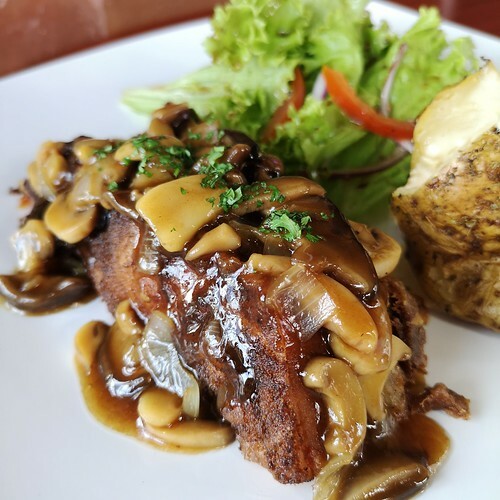 Deep fried premium pork ribs cut marinated in malt vinegar and tamarind topped with mushrooms and oyster sauce. Seafood Pasta in Tomatoes and and Coconut Milk that has a hint of spicy kick for those pasta lovers out there. 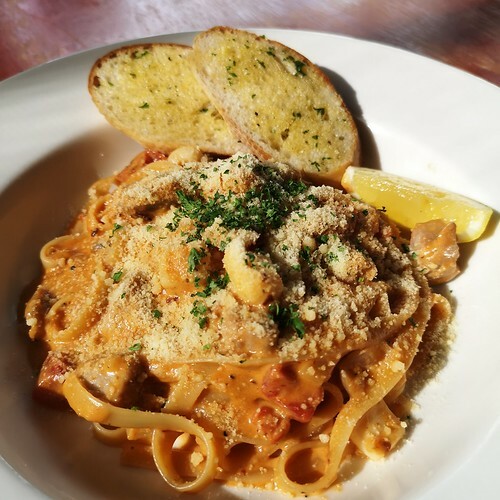 Fettucine pasta with squid, shrimps and tuna sauteed in tomatoes and garlic in coconut milk. 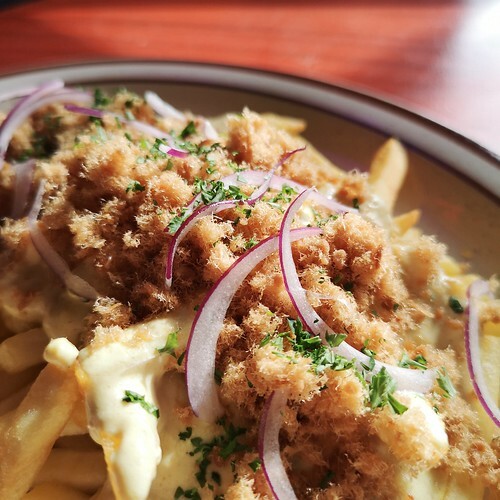 A chef’s special and a must-try! 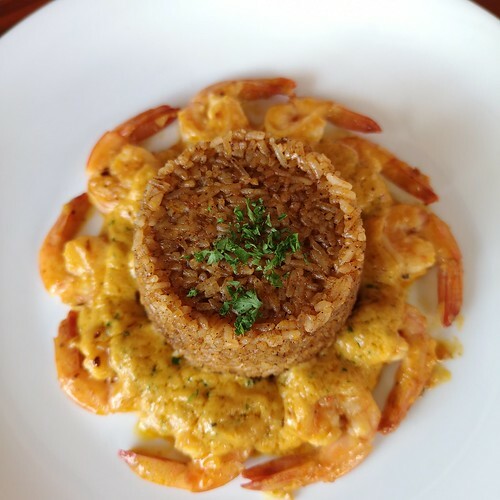 Shrimps in Chili and Coconut Sauce in Cajun Rice is a nice combination of seafood and flavored rice for comfort meal any day for me. For desserts, we tried two of TGFC’s bestsellers! 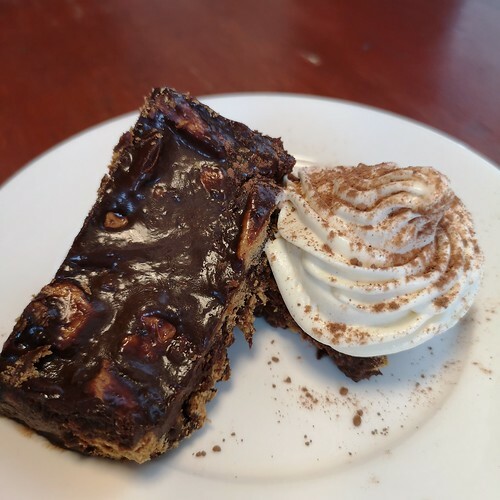 Chocolate Nibbler with creme de Chantilly – an old Ledesma family recipe made from native chocolate, grahams and milk topped with creme chantilly! 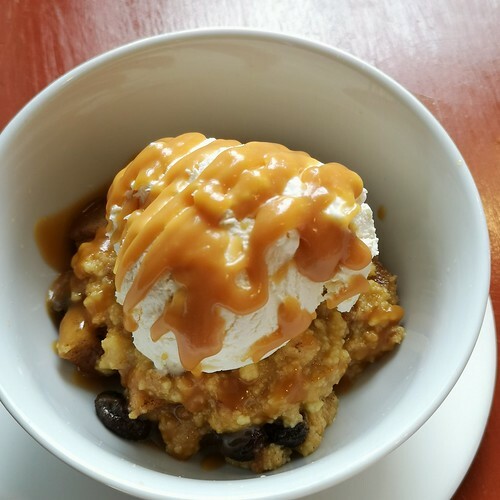 Their Apple Crumble was a delightful dessert to enjoy for sharing or for your own indulgence. Warm stewed apples topped with butter crumbles and their home made vanilla ice cream. I guess this became everyone’s instant fave! 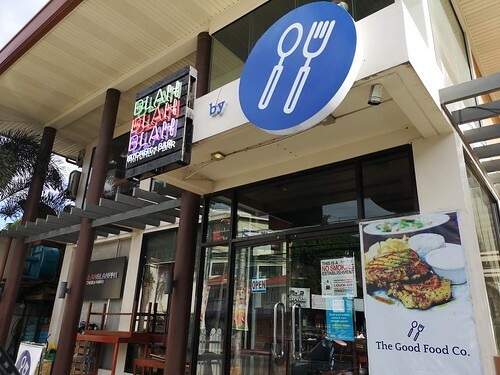 Blah Blah Blah by The Good Food Co is your place to go when you looking for good comfort food with good company. They are with foodpanda by the way, in case you want their food delivered instead at home or in your work place.